We enjoy having guests at PineSong. As we collect the photos, we will include more on this page. Here are a few to start. Chris and Lorraine Libbey are members of our church and good friends. Lorraine is active in our church and is a talented craft person and cook. For many years Chris has led a canoe outing into the Boundary Waters Canoe Area for our church youth. For the last two years, he has volunteered to be our camp cook for deer season and makes a great chili. Yoshiko is a second daughter to us. She spent several months with us as a Rotary Exchange student in 1993. When she graduated from college last year, she spent a week with us visiting school friends and enjoying the northwoods. 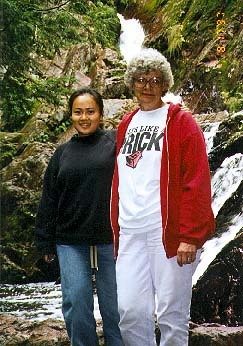 This photo was taken at Morgan Falls in the Chequamegon National Forest near PineSong. 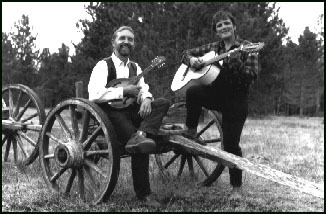 Pinery Road is the professional name of some very talented friends, Pete and Dot Lund. They write and perform folk music about the northwoods. 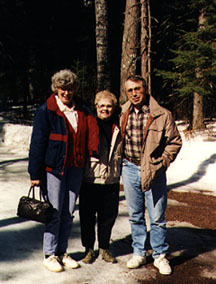 If you are interested in songs about the logging days in Wisconsin or other historic events and places in the northwoods you would enjoy their music. Besides a half dozen tapes on Wisconsin, they have a neat one about Man O War Cay in the Bahamas. Drop us an email if you want to know how to get hold of them. When they were staying at PineSong, we got snowed in and they had to help push the car out to the road! Christine was a Rotary Exchange student from New Zealand at New Richmond in 1997. She spent a weekend with us at PineSong. 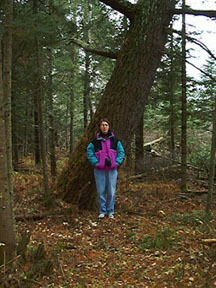 She is standing in front of the largest white pine tree on the property. When I measured the tree 3 years ago, it was slightly over 37 inches in diameter at shoulder height. For the past few years we have been getting together with some very good friends from our college days at the University of Virginia. Al and Dardi live in Richmond, Virginia where Al is a professor of Education at Virginia Commonwealth University. Dardi is very knowledgeable about Virginia history. Together with Al, she makes our visits truly memorable. On alternate years, they visit us. Last year we left PineSong and visited Grand Portage on the north shore of Lake Superior. 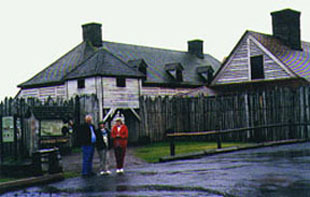 This photo shows the rebuilt main hall and kitchen with the gate house above the gate.